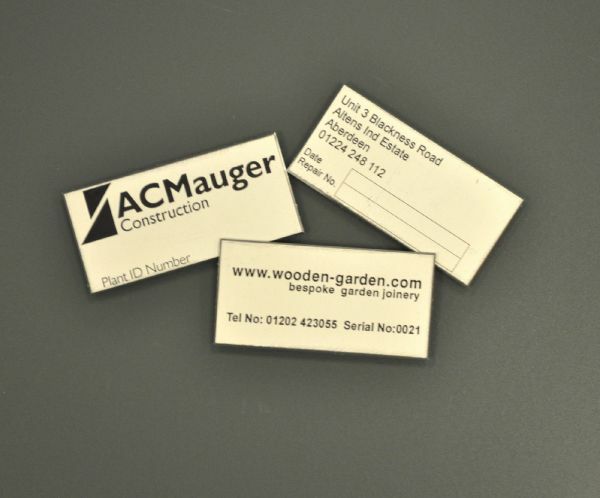 Anodised Aluminium Industrial Serial plates, measuring 50mm x 25mm x 1.0mm and supplied with bur-free straight edges, ideal for adding your company details to any equipment supplied. Ideally suited to exterior use and conditions such as harsh environments, long life applications and extreme temperatures. Printed 1 colour and sealed leaving a scratch and solvent proof finish. Plates are available with a self adhesive backing or holes for rivets and screws. Aluminium Anodic Serial Plates can be supplied with 2 or 4 x 3mm fixing holes, self-adhesive or without any fixings. If you would like variable serial no.s added, please enter them in the box below (Please note a small surcharge of 30% will be added). STEP 7 - Would you like to see a proof prior to production? Would you like to receive a proof?